Or – Why did my “restorer” finish the easy stuff and stop when it came time to the hard stuff? 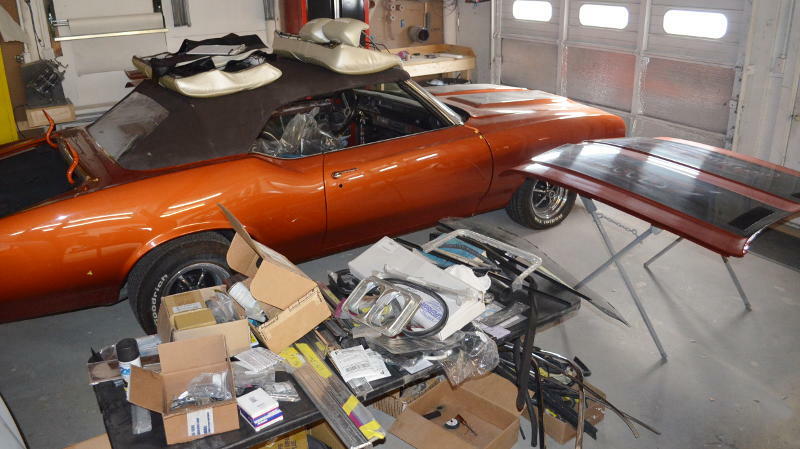 Or – Why did Wes bring his 442 to Easton Muscle & Custom? As Wes told me, he would like to drive his 442 sometime this year. After I inventoried his boxes of new and used parts, I saw that he brought us all the pieces. I talked with the heart of my team, and we came up with a short and a long term plan to get Wes on the road in his 442 by May/June 2019. An aggressive plan – but one we feel comfortable completing. This is what we specialize in – Finishing the Job – and getting the project back to the customer to enjoy. Picking and choosing the easy stuff, and ignoring the hard stuff, is what other shops do. Stay tuned, as we work to get Wes and his 442 out to shows this summer. Location: TALBOT COUNTY COMMUNITY CENTER. Stated properly: If you can drive it to the show it is welcome! Date: April 28, 2019. Time: Registration 8 to 11AM, Show 8AM to 2 PM. Rain Date May 5th. 100 Trophies presented, 200 dash plaques. Professional judging. Show Cars, $15, Spectators FREE. 100 Food by Milestone Catering, Fire Truck Display, K-9 Demo, Colors presented by Vietnam Veterans Group. Jalopyrama 2019: Saturday, April 27, 2019 at: TALBOT COUNTY COMMUNITY CENTER. 8AM to 5PM. Featuring inside show with 50’s Gassers, Dragsters, & Race Cars. Outside Show open to all 1963 and earlier American Cars and Trucks. Admission $10 Donation; kids and uniformed responders FREE. Benefiting local charities: Benedictine, MSRVG, Talbot Hospice, ARK. The 18th Annual Chrome City Ride, July 28, 2019. How to get there: Pre-register online and drive directly to Benedictine in Ridgely, Maryland. Better option: Go to one of the five registration locations – of course CPR in Easton, Maryland is the best! Register on site and then join the fast paced, escorted, non-stop, tour from the Registration Site to the Benedictine. Open to all Cars, Motorcycles & Trucks. No, this is not a story of the adventures of Lenny. 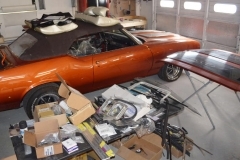 Rather, many Classic Car owners are faced with the age old problem of storage for their pride and joy, until warm weather reappears. 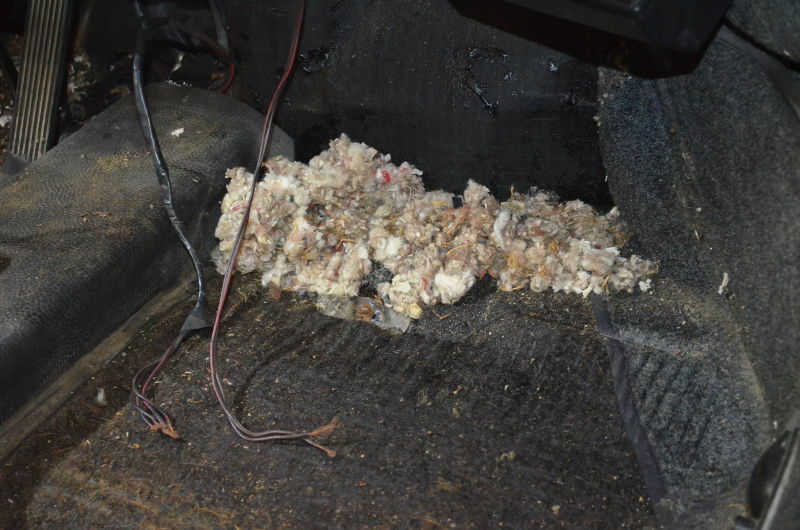 Two of the big problems facing a car during the storage period, are Mice and Mold or mildew. 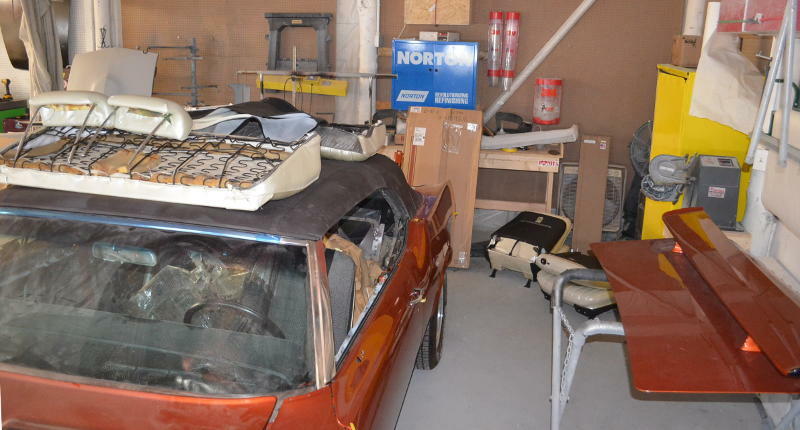 Mold is a pretty ugly entry into the interior that can ruin any future driving experiences. Sometimes by sickening odors, and in bad cases, by unhealthy contaminates. It is far easier to prevent mold or mildew, than it is to remove it. Ultimately, storing your car in a climate controlled environment with plenty of clean air circulating, is the best. Baring that, inside with little moisture and some air circulation helps. Moisture absorbing products, such as those found at the boat store, are very effective. What if you already have mold or a mildew problem? Well, a proper cleaning is the best way to begin. A thorough treatment, either by an Ozone generator or with an aerosol anti-fungal, seems to be effective in eliminating mold. 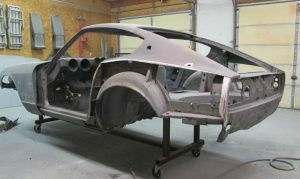 There are a few good Detailers and Mold Specialist companies who can help eradicate the Mold problem in your Porsche. You might also try a product from Biocide Labs, (www.biocidelabs.com) an aerosol product. Wear a good mask and follow the technician’s instructions on the use of this product. 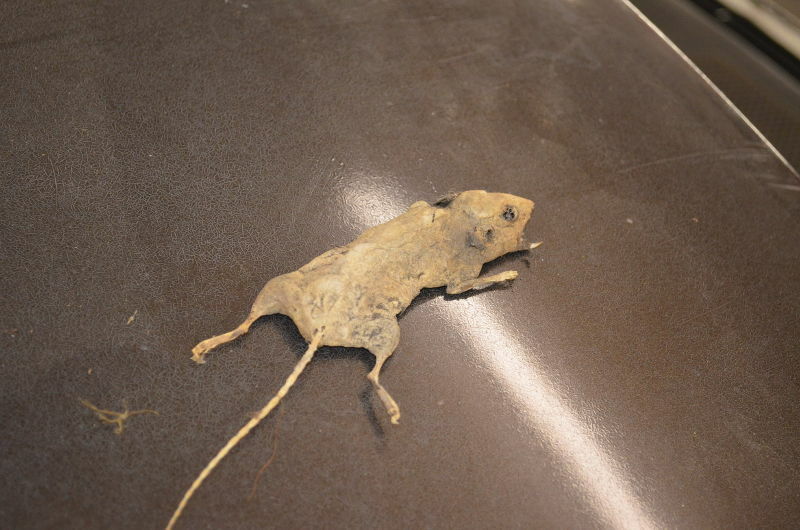 OF MICE – the little four-legged creatures who love to take up residence in your vehicle. They nest in your seats, eat your electrical wires, and other unpleasant things. I once was told that the soap “Irish Spring” worked better. So, I went out and bought all the Irish Spring on the shelves and put 2 or 3 bars in each car. Well, the mice love Irish Spring either as a snack or for Sunday dinner. None of the bars were left next spring – only the typical droppings! 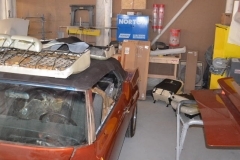 The best mouse protection is to keep your vehicle inside an area that is mouse proof. I have heard and seen all sorts of “mouse proof” areas. Working with a tight as possible garage, and using and checking good old snap traps regularly, is a pretty darn good approach. I don’t recommend mouse poison bait. A lot of the bait ends up inside your car before it kills the mouse. Other things, like moth balls, herbal concoctions, soap, commercial sprays, powders and gels help, but are not in the 75% or better “sure fire effective” area. I would say they can’t hurt. Pretty good results seem to be coming from the Electronic Repellents, or ultra sound generators, that plug into the outlets in your garage. The newer ones hook up to your car battery and install inside your car. They go where ever your car goes. They are a low draw, so should not result in a dead battery. However; a battery tender for long un-used periods would be a good addition. If you have a few good ideas, or things you know will solve the “mouse” problem, send them to us at sales@eastonmuscleandcustom.com. We will share them in our next eLetter. In this article we will be taking a closer look at some leading basics on a restoration project vehicle. 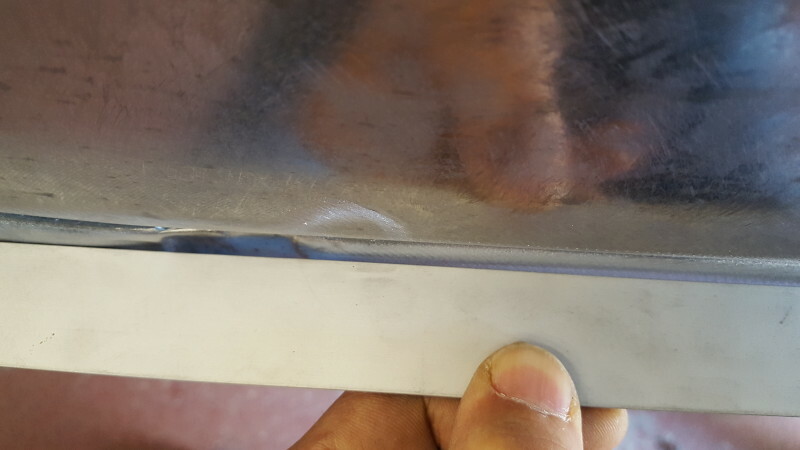 The purpose of this article is to explain how to professionally install and finish lead repairs using proven techniques. 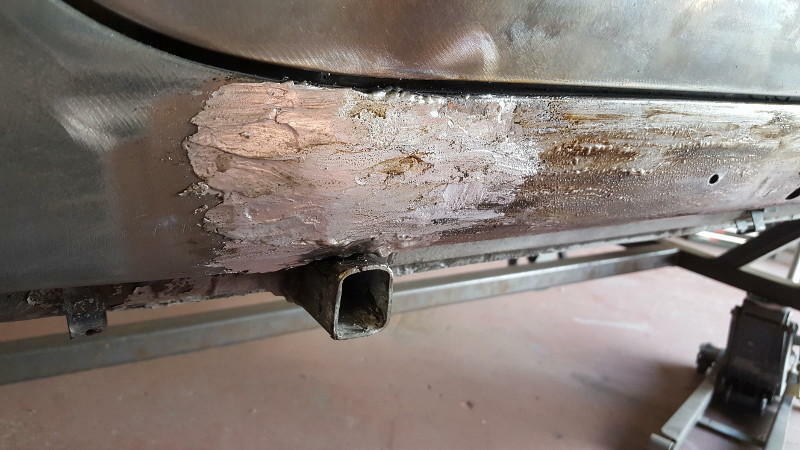 This can be the difference between a quality repair, and a repair that could fail in the future. Disclaimer: Before we begin, all standard safety precautions should be followed when working in a shop environment. Common sense rules the day! 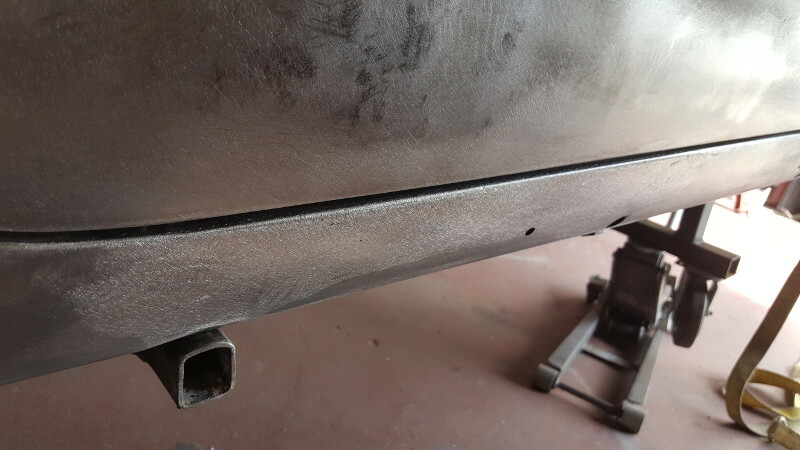 In Image 1, you can see that the area we will be working on is the factory seam where the rocker and the quarter panel meet, just above the jack post. This area has been cleaned, prepped and is ready for the lead work to begin. 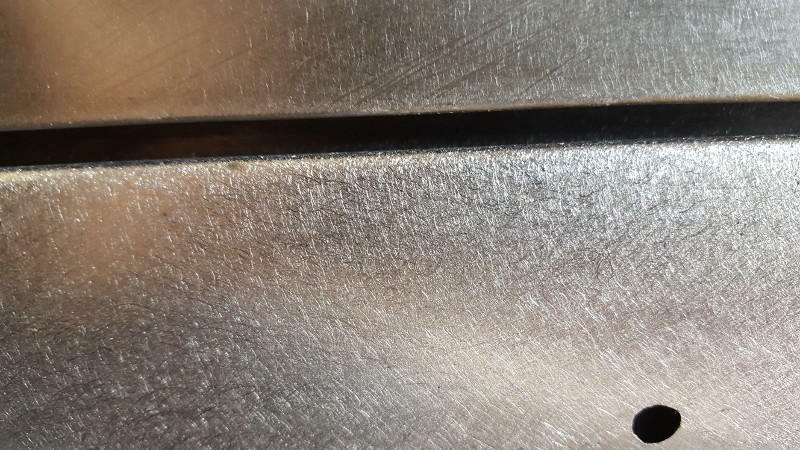 In Image 2, you can see the seam on the left but you can also see on the right, that the rocker edge is below flush in relationship to the quarter panel and the bottom door edge. We will be addressing both of these issues during this repair. In Image 3, take notice of the 3/32” gap, that at just few feet away looked negligible, but up close looks clearly out of place. Image 4, shows some of the basic tools we will need to do our lead installation. 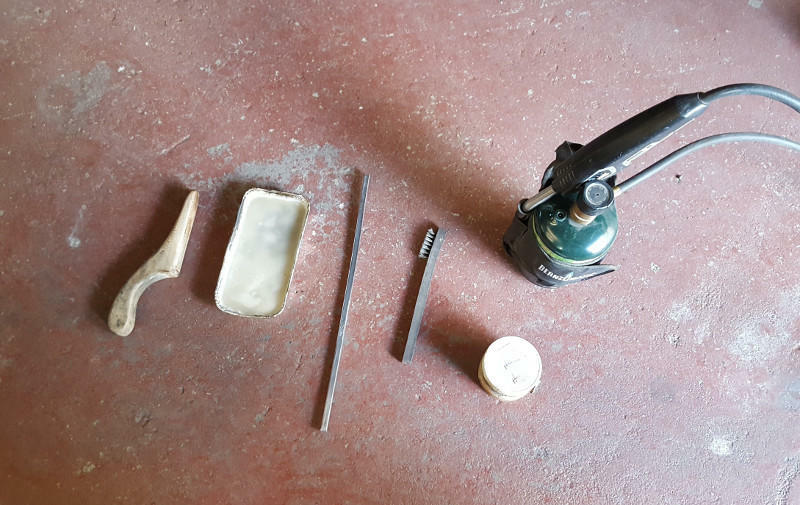 From left to right, we have a smoothing paddle, tallow, our lead, a brush and Flux­-N-SolderTM (the tinning product, which will be referred to simply as flux for the remainder of this article) followed by our heat source. wire brush to ensure 100% adhesion through out. This is the most important step of this type of repair. If the flux does not stick properly, then contaminants like paint or fillers are likely present. These contaminants can effect the finish of this repair and even the finish of the final paint job. Image 6 shows the entire area has been fully “tinned” and is ready to accept our lead. In Image 7, you can see that I have already started applying the lead. 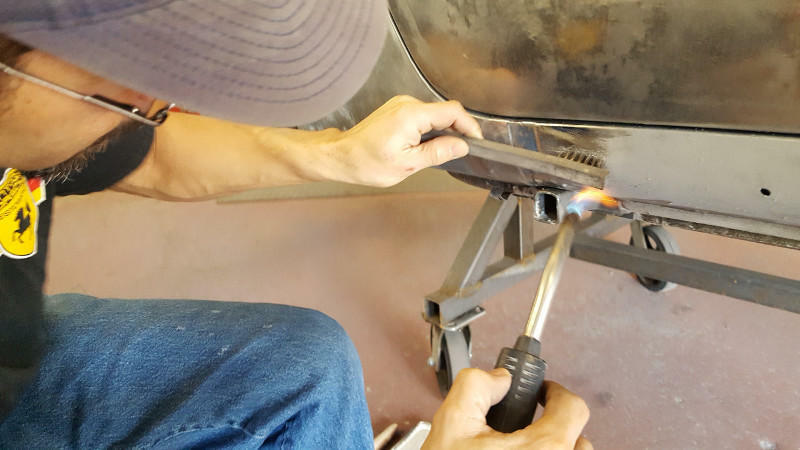 Like before, lead has a very low melting point so I work in small areas making sure not to over heat the base metal or the lead. 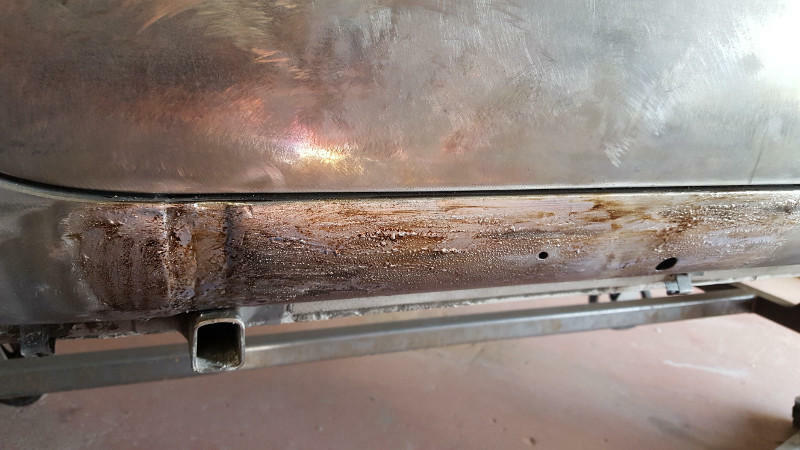 Too much heat will warp the surrounding metal and the lead will simply liquefy and drop off. In Image 8, I have taken the smoothing paddle with the tallow as a lubricant, and smoothed out the lead making sure that I have slightly over applied lead in all directions. Over applying will ensure a complete repair during the finishing stages of this repair. Now I will repeat this process down to the end of the rocker, doing an area of about 6”each time. Image 9, shows some of the basic tools we will need to metal finish our lead installation. From left to right we have a hand block, 2 body files and 2 inline sanders. Note: lead is a contaminant and is not intended to be sanded. 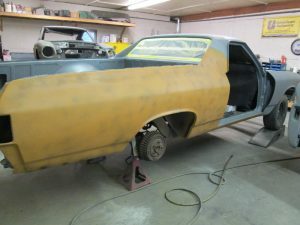 Most of the finishing will be done with the body files to keep the dust down. 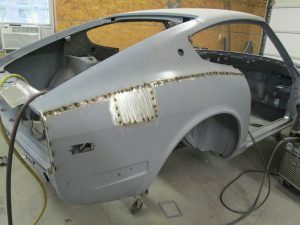 The sanding is used only as a visual guide to locate the highs and lows, like you would when doing traditional body work. In Image 10, I have started to file down the area while checking for any potential imperfections along the way. In Image 11, you can see the repair is almost complete. Most of the extra lead has been removed and the lead has been feathered out in all directions. Now we need to double check the accuracy of the work done so far. In Image 12, we are taking a closer look at our accuracy. We can see the the area that was the lowest in the beginning is now slightly too high. This will better match the natural contours of the door, but does require a little more filing. In Image 13 and 14 , the metal finishing has been fine tuned to match the shape of the body and our repair is now complete. 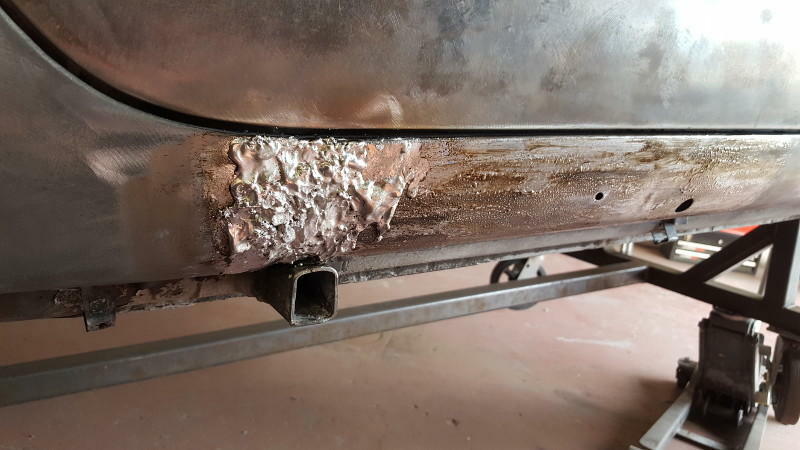 Some closing thoughts… Controlling the heat is key to this type of repair. 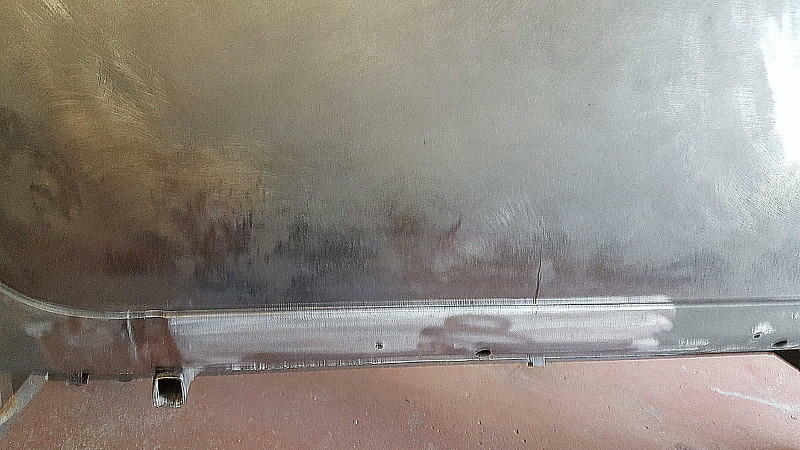 Once heat control is mastered, lead work can be done on vertical surfaces like this and in this case in particular, slightly over hung or upside down. Before we begin our paint removal techniques session, let’s have a point of understanding. Do we really need to take this baby down to bare metal to refinish it? Look, it is your car. You do what you think is best. In my opinion, you have to go to bare metal to do the job right. Why? Call me if you really don’t know. As you may recall in the last issue, we tackled the rust paint removal on the frame. 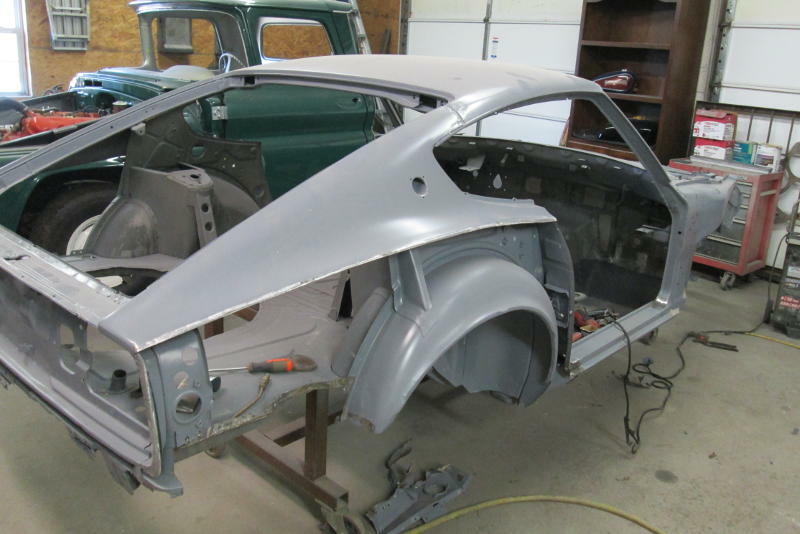 As for the body sheet metal, the process is the same – but it isn’t. 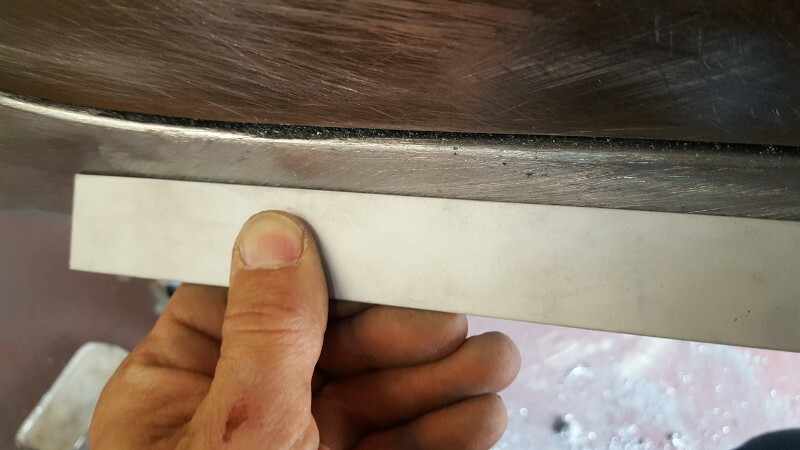 The thickness of the frame metal is much more forgiving than the body sheet metal. Older pre 50’s cars had a standard 12 to 14 gauge metal which handled more aggressive grinding and blasting. 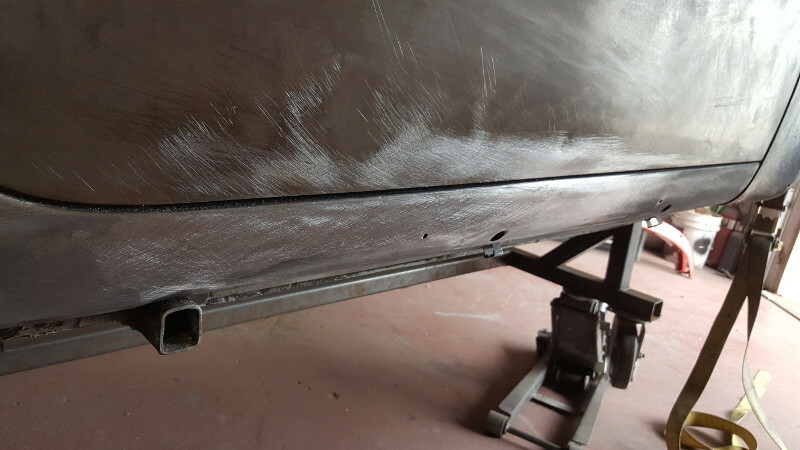 The 16 to 19 gauge modern sheet metal bodies are not as forgiving. 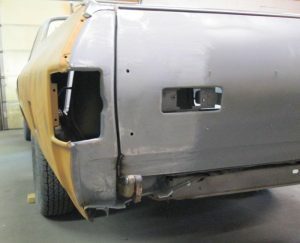 Improperly prepped sheet metal will eventually start to rear its ugly head and begin to show signs in the final paint. It may take months or years to show up, but it will show up and there will be no question of why you are seeing blemishes under the final paint. Blemishes in the paint are another issue. Forget all of the “possible” approaches to get down to bare metal. As far as I am concerned, you only have two options. Only one if you are going to do it yourself. 1st option, or the only DIY option: Blasting with sand or broken reconstituted glass. 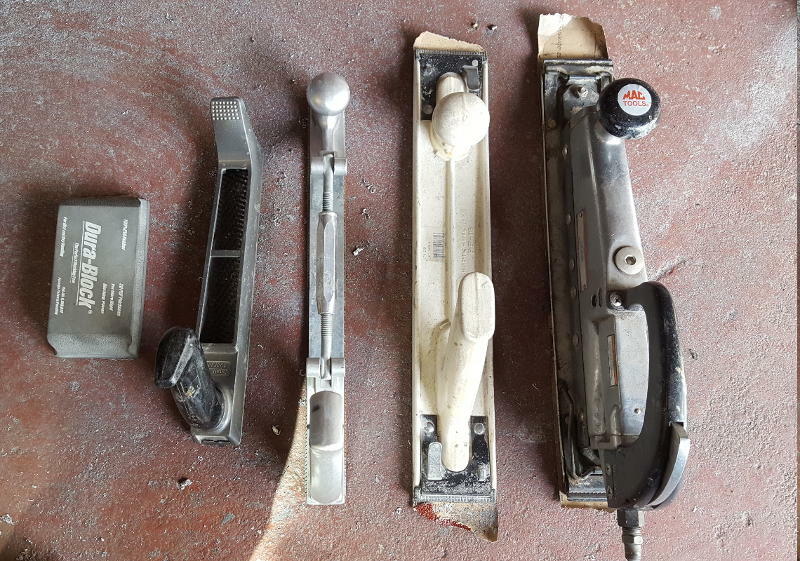 These are the only media that will cut the rust down to bare metal properly. Both methods can cause metal distortion. Glass generates less heat. Keep the blast nozzle at a low angle to the work piece. Coming at the metal with the nozzle at 90 degrees or sightly less is going to create problems. Try to finish the body blasting in as little time as possible. Then coat the bare metal ASAP with Epoxy Primer ONLY. Remember primer is not the same as Epoxy Primmer. If you can’t finish all the body parts in one day and coat them, do one part today and another tomorrow. This is more time consuming due to paint clean up, but you will be happier with the results. 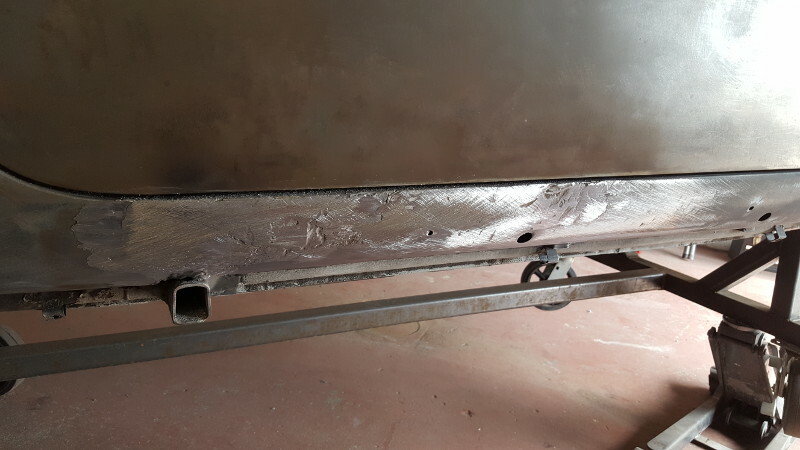 2nd method – Dip Bath, with dip neutralize bath and sealed with E Coating. E coating is that black paint stuff you get on factory new parts. Body and parts get submerged in a bath that removes everything but the metal. (It will remove the metal if you leave it in for too long). Body and parts are submerged in a second bath. I said submerged, not sprayed or rinsed. The 2nd bath neutralizes the chemical in the 1st bath. If you don’t neutralize the 1st bath, it will work out of crevices over time and attack your paint – I speak from knowledge. 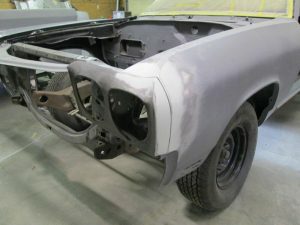 Finally, have the body and parts E Coated for ultimate rust prevention. As an acceptable alternative rather that E Coat, an Epoxy Primer coat immediately after stripping is OK. You can’t wait until you get it home to do the Epoxy Primer. That’s it! A good solid base for the re-birth of your classic! 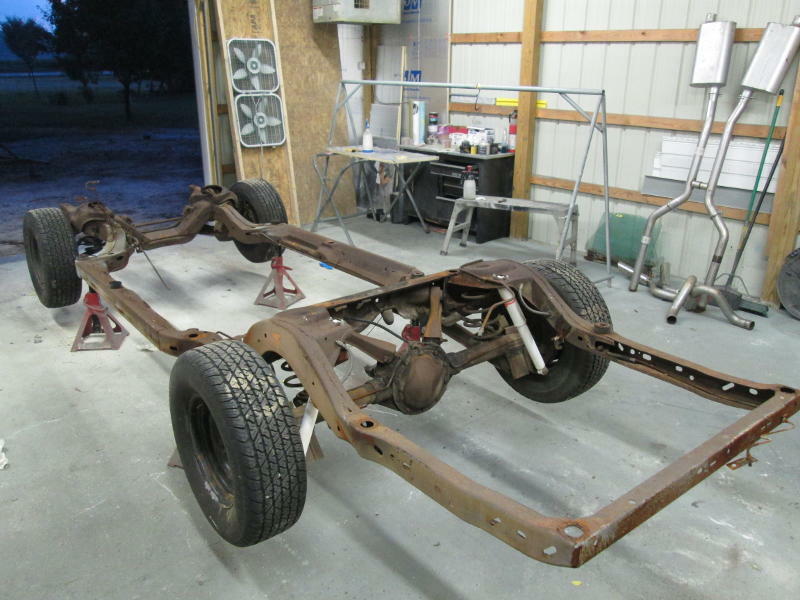 During the planning stages of every properly done restoration project, what to do with the underbody or frame, demands consideration. The 1970 El Camino resto mod is no exception. You guys and gals didn’t think we were going to bolt on a lot of cool stuff and not properly detail the frame did you? 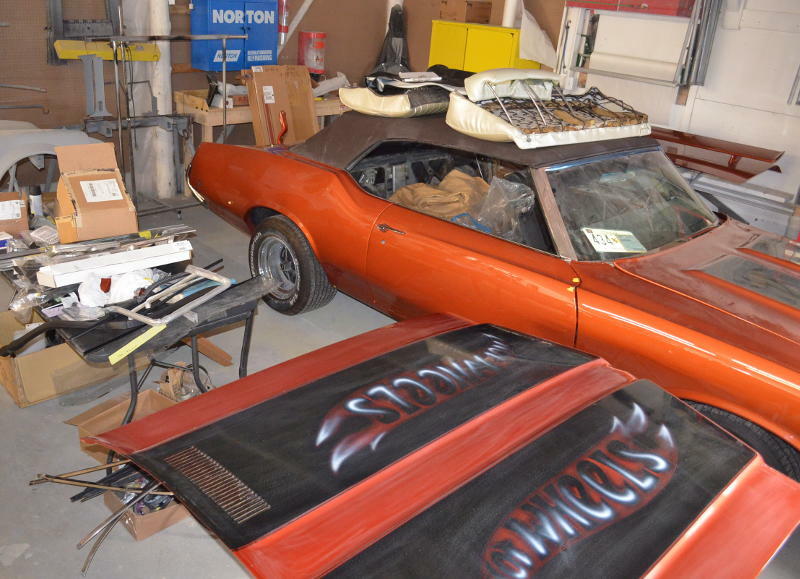 Over the years, we at Easton Muscle and Custom have explored, and even tried some approaches, to what are we going to do with the rusty frame. Some things work. Some things work really well, and some things don’t work at all. The real honest approach to the “rusty frame” problem is very simple: You only want to do it once – and you want it to last. The car frame, or underbelly, takes the most wear but needs to look great on an outstanding car. It is the foundation for your project. The rust and scale must be removed down to bare metal. The best, less time consuming and least expensive way to do this, is by blasting the frame with sand or glass. 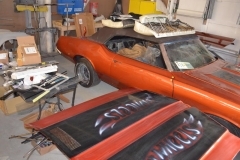 Easton Muscle and Custom started with very inexpensive equipment which has evolved over the years. 1. A common inexpensive approach is with a gravity feed blasting unit. The media hopper is filled while gravity allows it to flow into a mixing valve where air pressure forces out of the hose and nozzle onto the work piece. This approach gives good results, but is more labor intensive than the upcoming equipment choices. Pluses for this method are; low equipment costs for the blasting and air compressor units. 2. Small Pressurized blasting units and a higher CMF Compressor. Similar to the above, but the hopper is pressurized which forces the sand or glass down to the mixing valve in greater volume. This type of equipment provides a greater flow and higher nozzle pressure, which cuts to bare metal faster. 3. Commercial grade Pressurized Equipment with a large CMF compressor. Strictly a volume upgrade to the unit in #2. High volume at high pressure reduces completion time. The choice of sand or broken glass for frame blasting. Which ever one you choose will work well. Why? Unlike other media choices, blasting sand or reconstituted glass is sharp edged and durable to cut through the rust to bare metal. Both can be used more than once, if properly screened to remove all debris. Sand is a little more dirty and causes an elevation of heat friction. It is also hazardous to the operator and environment. Broken glass product has all of the pluses of sand, but is less hazardous and causes less heat. Note: blasting heat is not a concern on the thick frame material. 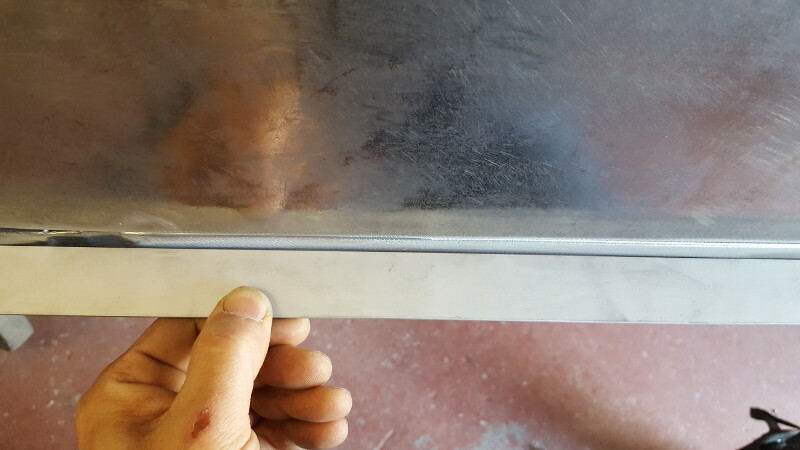 Thin sheet metal is a different story. We use “Fastblast 40-70” reconstituted Glass. Check with several material suppliers to see what they recommend for the equipment you are using. I say “several” suppliers, because they may recommend what they have in stock, not what is best for your equipment. You can always bounce it off us at Easton Muscle and Custom. Please make sure you use the proper safety and protection gear when blasting. This stuff can hurt you or a bystander. 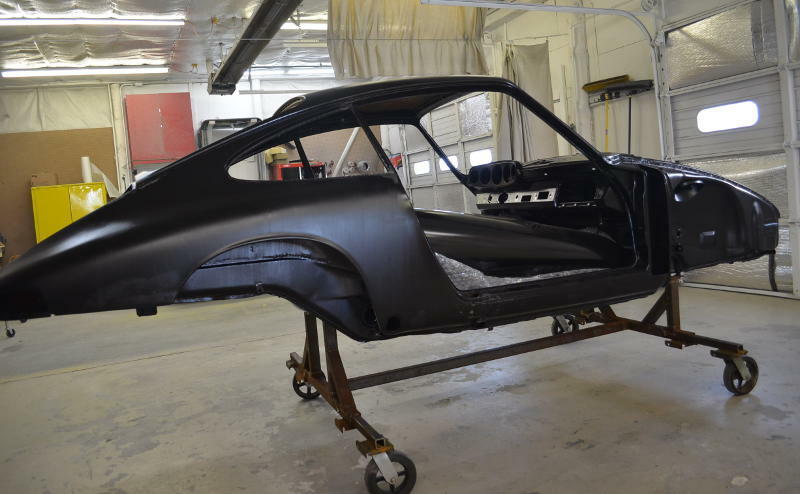 Finally, get the bare metal covered with epoxy primer or powder coating as quickly as possible, especially in high humidity areas. 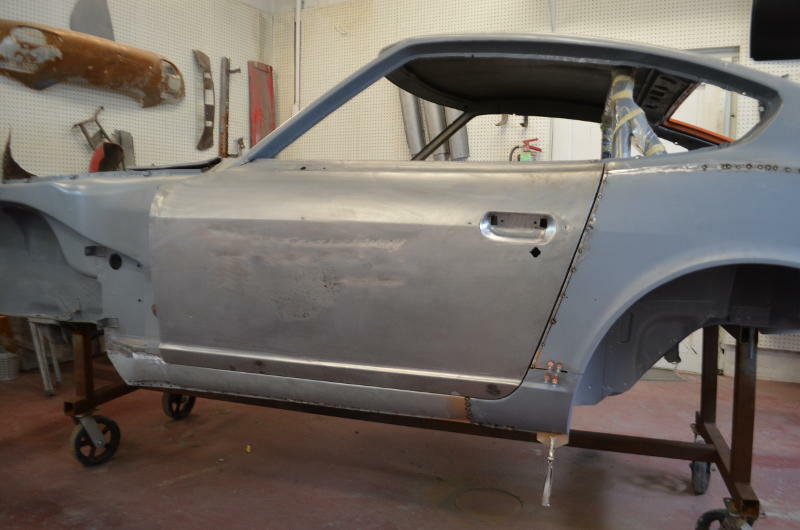 Bare metal will start the rust phase in a matter of hours. 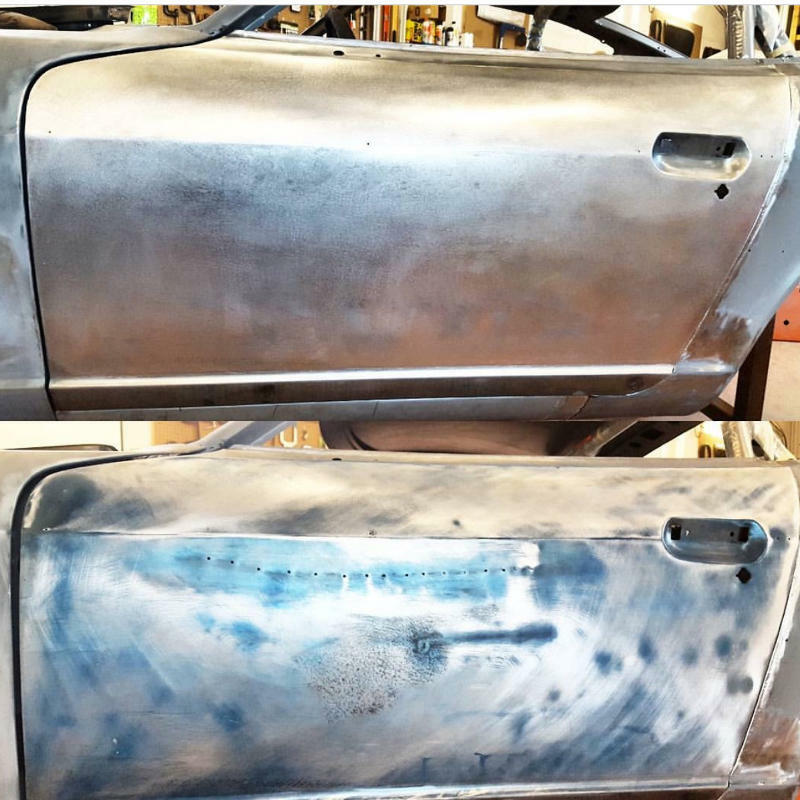 There are very few options that prevent rust on bare metal. For cost and the ability to do it yourself, nothing in my opinion, is better that Epoxy Primer. Other things can be better or cheaper, but not both. Epoxy Primer, not to be confused with regular primer, look alike but are not the same. Epoxy Primer seals the bare metal from the elements. Regular primer does not. Next best is powder coating. 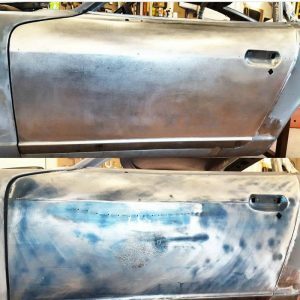 Not only does it prevent rust, you can also choose colors for a real custom look. Powder coaters often prefer and will do the blasting part as well. If you are leaning towards this approach, check pricing with your Powder Coater. Best option, in our pinion, is E Coat, a specialized approach to preventing rust on your frame for a long time. 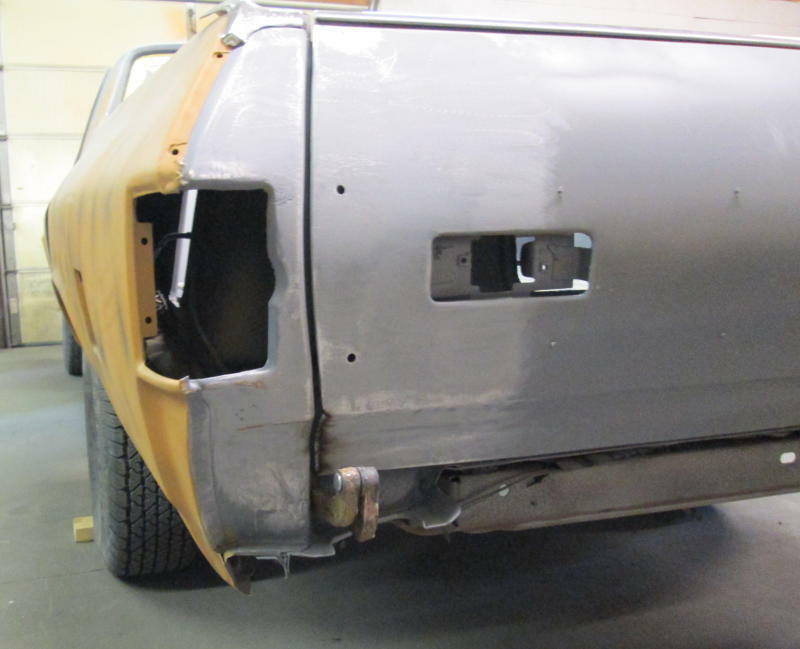 In the next issue we will discuss paint removal on the sheet metal body and preparing for metalwork. 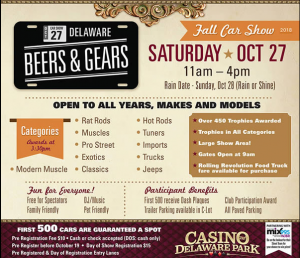 Come join us at the 2018 Beers and Gears Event. Saturday October 27, 2018. 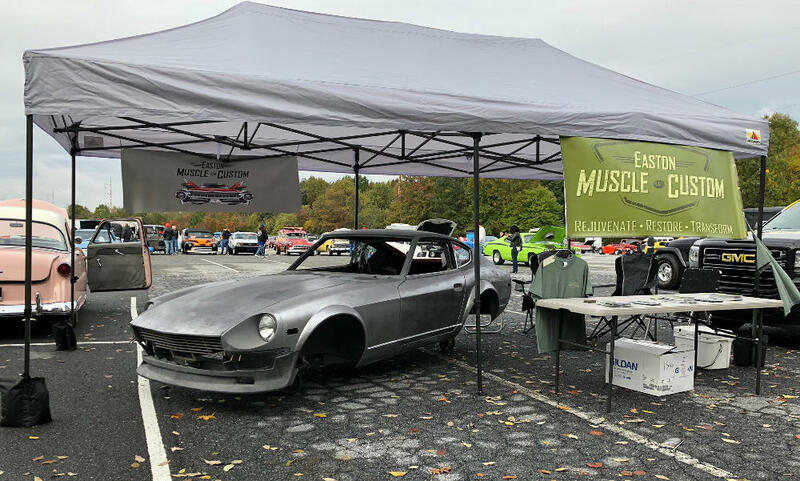 Easton Muscle and Custom will be a vendor at the 2018 Beers and Gears event at Delaware Park. Our display will include examples of our workmanship and creativity so please stop by and meet the crew.